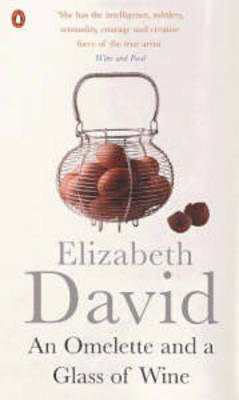 Back in print!An Omelette and a Glass of Wine, offers 62 articles originally written by Elizabeth David between 1955 and 1984 for numerous publications including The Spectator, Gourmet magazine, Vogue, and The Sunday Times. Jane Grigson praised it for including all the dishes most closely associated with her, Spiced Beef, Salted Welsh Duck, and Syllabub. Her many admirers will cherish this new edition for its 320 high quality pages interspersed with charming black and white illustrations and some photographs.